It has been three years since an attractive filly by the multiple Group One winning miler Canford Cliff’s caught Allison's eye at the Inglis VOBIS Gold Yearling Sale... "she was neat and correct with scope to get over a mile and further... and she was very pretty!" Fast forward to early 2018 and the filly christened Ciceroni makes her debut but her first couple of runs are all about experience; she still has a bit of maturing to do. 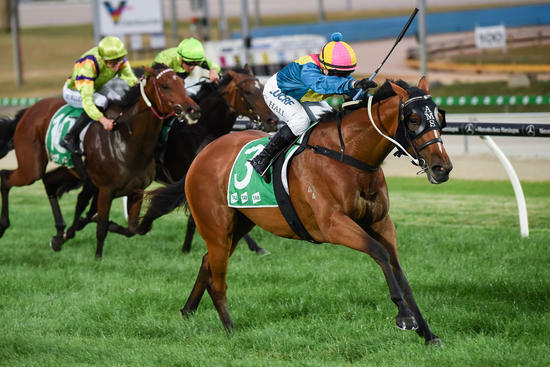 Thankfully Ciceroni has understanding owners, a large and happy group (many of whom are first timers) who were rewarded for their patience when their mare so impressively broke her maiden at Cranbourne on Friday night. Having finished off nicely at her previous outing, Ciceroni looked nicely primed for her first attempt at the 1600m she is bred for and there was a degree of confidence heading into the race. "She'd had a bit of bad luck in the lead up," Allison said, "but she had been going well and we were very happy going into the race." And happier still was Chelsea Hall - who has ridden Ciceroni at home - gave the bay a great ride - "she rode her perfectly. She does a bit of work for us and I am glad that she has been rewarded by a win." "She ran really well over a shorter trip last start - she got held up a couple of times and should've finished closer," Chelsea reported - "so we had a good feeling about her today." Confidence increased when there was some rain fall and a track downgrade - "that really helped her as she does appreciate getting her toe in a bit as the breed generally does," Allison said. "I think she will get right up to 2000m," she added, "and I think there is a bit more in store for her." And those who saw just how easily Ciceroni won - settling beautifully behind the leaders before making her run turning; drawing clear from the 150m to win by a soft 2 1/2 lengths - will agree! Bred at Blue Gum Farm, Ciceroni is the third foal and second winner produced by the unraced Churchill Downs mare Caponi. Also the dam of a yet to be named full brother to Ciceroni and a War filly, she was served last spring by Gold Standard. Caponi is a daughter of the durable stakes winner Delgara who won nine of her 50 starts before producing six winners including the VRC St Leger winner Inkster and the Gr.3 placed Sorenstam.